Kewaunee Counties 20,500 residents do not have an effective media that keeps them informed. The closest we have as any County-wide media would be Kewaunee Star News which is big on sports and advertising, but woefully lacking on the county news front. Most importantly, there is nearly zero reporting on what is going on with regard to local school boards, county board, city or town councils and even township news.An informed citizen is a citizen who can make better decisions when going to the polls to vote. The Republican Party of Kewaunee County is providing you a convenient, easy way to access the monthly goings-on in Kewaunee County. It is not our intent to editorialize, however from time to time, if the subject matter calls for it, we may add a comment or two. July 26 – Is retroactive pay in the cards for mistakes? July 18 – NIMS (National Incident Management System) compliancy low in County – 199% Overtime in Jail? August 10 – Medical expenses for Jail need to be increased, why not explained! 13 May – A total non-event? Click here if you wish to download a printable PDF version of this update. Your involvement has made a difference, but we have a long way to go! Tax rate and employee salaries: In spite of having a board majority that is not willing to make the tough decisions for the county, we have managed to make headway in managing expenses over the past year. The tax rate was not increased for 2014, but it wasn’t decreased either. The tax rate for 2014 will be $7.77 the same as 2013 tax rate. Do you remember how we tried to vote out the 2% across the board salary increase for the county employees last October? Well, we didn’t succeed at the budget meeting, but the good news is that salaries for 2013 were not increased and we saved $168,000 which should be restored to the general fund on December 31. All the unions settled for a 0% increase for 2013. County employee insurance: The Personnel Committee really missed an opportunity to implement meaningful changes this year on health insurance as many other counties have done. They did not dig deeply into pursuing new health insurance options, but instead, allowed the same provider, Horton Group, represented by Rae Ann Buedry, to come in once again with the same sales pitch she has used for the past years. At first she came forward with a 14% increase, but at the end of the day found a way to keep the costs for 2014 to be the same as 2013. Our employees are still paying 10% towards the cost of their insurance with the county paying 90%. This really is inexcusable as virtually all county employees across the state are paying a minimum of 12.8% up to 25% as their portion of health insurance. For your information, our family plan insurance cost per year is $22,332 and the single plan cost is $9,084. Given what we are learning now about the cost of the private sector insurance increases, it is time for Kewaunee County to initiate major changes to our health insurance program going forward. By the way, our Administrator still enjoys 100% of his insurance paid for by the taxpayer. Your board chose not to deal with this either! Highway Department /Landfill: As we painfully recall, our highway department has experienced millions of dollars of losses over the past several years. This was a direct result of management not making tough decisions to restructure the highway department to the realities of the current environment. Once again, the management of the highway department is: the Highway Commissioner, Jandrin, who reports to the County Administrator, Mr. Dorner. The Commissioner is retiring in February and we now have an opportunity with a new Commissioner coming online to restructure the department to the needs of the county going forward. It is unfortunate for the employees of the department that a restructure move wasn’t implemented over a period of time, as now they are experiencing a difficult manpower crunch at what can turn out to be the busiest time of the year. On the landfill front: About two years ago the county paid landfill consultant projected estimates of remaining air space in the landfill and underestimated the remaining space we had in the landfill. During that analysis, the consultant underestimated the remaining space available. As a result of that underestimation, the decision to build cell #10 was taken. Cell 10 construction was finished in November of 2012 and the county had one-year grace period to cover the new cell. After the new cell #10 was built, new estimates of remaining air space were provided by the engineering firm Ayres Associates, who found the landfill had a lot more air space than had been estimated earlier by the consultant. Latest numbers show we have just over 7 years of space left. Had we had the correct numbers to begin with, we wouldn’t have had to build cell #10 at this time and we could have saved an estimated $100K we have incurred pushing tons and tons of garbage from cell #9 to cell #10 to cover cell #10 to be in compliance with the DNR requirements. The estimated $100K is cost of fuel, manpower and equipment, plus while we are waiting (3 or 4 years) to fill remaining space in our other cells, we have to continue to pump leachate ($20-$25K per year) through this new cell as required by law. Another project at the landfill required a cadre of about 12 highway workers for almost the entire summer was a capping project to cap cells #1-8 and a small part of cell #9. While this job at the landfill was being done, 4 miles of highway resurfacing that was budgeted for county road S north of Algoma was not finished in 2013. The money, some $650K, for that project has been held in abeyance in the highway department coffers and another $724 was budgeted for 4.5 miles of county road S north of Algoma work in 2014. It will be important to watch where that $650k for that 2013 project is applied. New Taskforce Created: The shutdown of the Kewaunee Nuclear facility by Dominion has caused hardship and change for many Kewaunee County families and will continue to affect the economics of the county in many ways. The KCEDC, which receives $40K from the county annually for the past several years, worked with the WEDC and other state organizations to provide a conduit whereby information from the various entities, Dominion, NRC, WEDC, Wisconsin Job Centers, etc., could be consolidated and pushed out to affected businesses and displaced employees. It is very clear that the county and particularly the township of Carlton have to stay connected to our legislators, DNR, NRC and Dominion as the 60 year shutdown of this nuclear plant takes place. Going forward, decisions will be taken by Dominion and the NRC as to timing of events with regard to the total closing of the site. Mission: to provide leadership, guidance and recommendations to corporate and government entities and ensure that the best (economic, social and environmental) interests of the residents of Kewaunee County are considered throughout the decommissioning process of the Kewaunee Power Station. I was one of several supervisors who voted in opposition to establishing this task force as we have a full-time County Administrator who will be in contact with the NRC and Dominion and any other entities that will require communication with the county. Carlton Township management is also on top of this issue. This Task Force has no authority and has no quantifiable goals, so to me it is one more committee that will be paid to for meeting attendance, travel, etc. and will deliver nothing. Also, in as much as the County funds the KCEDC to coordinate Economic Development activities in our county, it seems to me they could continue what they have been doing for the past year in regard to the Nuclear Plant shutdown. What threw up the red flag to me is; at the same Kewaunee Co Board meeting this Task Force was proposed, the Chairman of the Board, Mr. Weidner brought information to the board that this committee wanted to send one of the members to a meeting in North Carolina that would cost taxpayers $1,200 (this was not approved). A week later the Finance Committee approved diverting $3,000 of unspent money from the UWEX University of Wisconsin Extension budget to hire a University of Wisconsin graduate student for 200 hours of work to research certain undefined issues surrounding nuclear plant shutdowns. Supervisor Jim Abrahamson put forth that motion, it was seconded by Brian Dax and the motion carried unanimously. My next question was: Is there a budget for this Task Force? Where does the spending begin and end? There is no budget, but Chairman Weidner indicated this Task Force will be funded from the budget as established for the County Board activities. Human Services: Our Human Services department has a new Director in Gregg Thousands who has inherited somewhat of a financial mess he must to manage his way out of. This department registered a loss in excess of $1.29 M in 2012 which wasn’t identified until September of 2013 when the auditors rendered their report. The largest portion of this discrepancy, about — $750K– resulted from a program called WIMCR (Wisconsin Medicaid Cost Reporting). The WIMCR program is an extremely complicated government program that requires annual cost reporting by certified public Medicaid providers for the following services; home health services, medical day treatment services, outpatient mental health and substance abuse services, personal care services and substance abuse day treatment services. The balance of the loss was attributed to cost overruns in mandated services for child protection and behavioral health services. Gregg Thousands is very aware of these issues and will have the challenge of trying (I say trying, because with some of these mandated programs there is very little local control). Gregg has introduced procedures whereby he will have a better handle on what the individual employees are accomplishing in his unit. A personal note on this whole Human Service issue: As a society we don’t want anyone to suffer, but in recent years, we are spending more and more of our tax dollar to assist those apparently in need. From both the Federal and State level, more and more mandates are being pushed down to county level causing counties to dig deeper into the local taxpayer pockets to support these programs. I personally believe there should be more accountability from those people who are receiving these services. It is a tremendous and growing problem that needs attention. Schedule 2 Employee Salary Increases – this will get your attention! Gulbrand, Chris Lt. Sheriff Dept. Hanson, Steve Land Information Dir. Important Note: The three salaries highlighted in red not only received an increase in base pay, but they each received a $1,500 bonus as a result of the management contract the county entered into with the city of Algoma for management of the Algoma City Police Force. There was no mention of bonus money in the contract and it seems our Sheriff and his management team were confident they could manage the Algoma force with existing staff. This was presented to the board in a resolution on Dec 17th and it passed the board by a vote of 13 to 6 with the following board members voting in favor of these bonuses: Barlow, Heidmann, Abrahamson, Paphlam, Weidner, Wagner, Swoboda, Hutter, Mayer, Dax, Rueckelberg, Koenig and Garfinkel. This action seems to me to set a precedence and is a very onerous one at that. Suppose that Kewaunee Co. decides to partner with Manitowoc, Brown or Door County on some other actions or agreements, or the County provides services to another city. Are any of those employees involved in those projects automatically going to be given bonuses? Total increase in base salaries and bonuses for this group of people totaled $25,942. But when you consider the fringe cost of retirement, workers comp, and SS, the real cost of those increases is $30,984. And if one considers this over a period of, let’s say ten years, it is $310,000 cost. Prior to the Personnel meeting of Dec 11, where on the spot decisions were made as to Schedule 2 employee increases, I had completed a salary study of 11 counties (comparable both in equalized value and population) to Kewaunee County. Even though Door and Manitowoc Counties are not comparable to Kewaunee County, I left them in the comparison because of their geographical location to Kewaunee County. This study was completed the week of December 2, 2013 by me personally calling either the County Clerk or the HR person in each of the 11 counties to get their 2014 salaries schedule for the positions listed in the table above. This survey took about 8 hours of calling time to complete. My survey results showed that about $14,500 of the $26,000 salary increases should have been granted. Chairman Weidner is well aware that the “comparable” county set of Calumet, Door, Manitowoc, Marinette, Oconto, Shawano and Waupaca counties used by Carlson Dettmann are not comparable to Kewaunee County. In fact the only county that is even close is Shawano County with equalized values of $2.9B and population of 41.7K. Remember, our equalized value is $1.42B and our population is 20,500. What is more interesting is that last spring, Chairman Weidner chose to use a combination of the study I completed and Carson Dettmann information to negotiate a salary freeze for 2013 for all the other employees. I agree with Chairman Weidner that Kewaunee County does not have a viable employee evaluation/rating system in place, an evaluation system that would provide some indication as to whether an employee should be considered for an increase. But in lieu of having that system, the next best information is a survey of what comparable counties are doing with salaries. So, following the December 11th meeting of the Personnel Committee where the decisions to increase these salaries was taken, it took the Secretary of the Personnel Committee, Mr. Barlow, a full 6 days to complete the minutes and have them posted the afternoon of Dec 17th for anyone to see. That means board members did not have any information on these proposed increases until they sat down at the board meeting at 5 P.M on the 17th. District 2, Supervisor, Larry Kirchman rightfully argued the board members did not have time to study this issue in as much as they had received the proposal so late. I also supported that position and reflected on the Personnel Committee taking these decisions in a matter of minutes with little or no research to justify the proposed increases. I put forth a motion to table these salary increases until the January board meeting which would give the board members time to conduct their own research and to understand the overall impact of these increases. The motion to table was seconded by District 13 Supervisor Delebreau and the motion carried with 10 members voting in favor of tabling the motion. Members that voted against tabling were: Barlow, Heidmann, Abrahamson, Paphlam, Weidner, Wagner, Swoboda, Hutter and Mayer. Changes are in the wind: DO YOU LIKE YOUR BOARD? YOU CAN KEEP IT, PERIOD! I have been serving on one committee, that being the Health/Vets and Child Support. However, I have been attending almost all of the committee meetings of Finance, Personnel, Highway & Solid Waste to learn and understand what is going on, both at the committee meetings and the departments. It has been both enlightening and frustrating to watch. What I have found, is that most of your paid committee members do little work in preparation for their committee meetings. Decisions seem to be driven by information provided them by the Department Heads on those committees. Only a few board members asking meaningful questions at these meetings. My guess is they have not studied the topics on the agenda and have not prepared to discuss those items. Why do I bring this up? Elections are right around the corner and it is up to you to elect a board that will represent you, a board that will be thoughtful, a board that will study the issues and put their shoulder to the wheel, and be willing to make the tough decisions that this county needs going forward. Your involvement has made a difference and you can continue to make a difference starting with electing board members that will be engaged and represent you, the taxpayer! Is Kewaunee County facing a financial crisis, a management crisis, or both? ——-You Decide! Here are some facts about Kewaunee County, read them, evaluate them and then you decide crisis or not? Kewaunee County employees are more than well paid, on average $3,704 higher per employee to comparable counties. This costs Kewaunee County over $650,000 annually more than those comparable counties. Kewaunee County provides its employees a fully comprehensive health insurance that costs the County $22,233 per year per employee who is enrolled in the family insurance plan. Single plan cost is $9,084. Total cost of insurance to the county is $3,047,364 for the159 employees who are enrolled in the plan. Employees contribute 10% of the cost of health insurance as they have for the past 30 or so years. Kewaunee County has over $23 million in combined debt and debt service.­­­ Cost of this debt service is in excess of $1,500,000 per year (Note1). Kewaunee County has the 5th highest county tax rate in the state with $7.77 per thousand (for comparison sake, Door County rate is $3.55, Manitowoc County is $5.74 and Brown County is $4.68) Our ability to tax is based upon our counties equalized value (Note 2). Our Kewaunee County Highway Department has lost $2,866,000 over the period 2003 – 2012. For the period 2009 – 2012 alone, this department has lost $1,984,000. These numbers include the depreciation of equipment and the overall net asset values of the department (more on the highway department below). In the past months, over 1200 properties in the city of Algoma have been reassessed and on average, the property values have been reduced by 13%. In the near future, it is reported the city of Kewaunee properties will undergo the same reassessment. These reduced assessments will have an effect on equalized values for the county and will force the county to do one of two things; reduce expense and services or increase taxes once again. As a result of the closure of the Kewaunee Nuclear plant, Kewaunee County will, after four years, lose estimated $735,000 annual revenue. Payments to county from Dominion will be reduced per the following table. Unless there are cuts in operational expenses in the county this shortfall of revenue will lead to higher taxes. Kewaunee County Inland Home sales for the period Jan 1through May 31, 2013 are down 60% from 32 sales in 2012 to 19 sales in 2013. Combine that statistic with the 20% reduction in sale price and this is not a good picture at all. In 2012 the Kewaunee County median priced home was $68,250 and in 2013 that price dropped to $55,000. Door County, on the other hand experienced a 17% increase in the value of those inland home sales from $130,000 to $152,000. Given our Kewaunee Nuclear plant closure, we are likely to see this trend continue or even worsen. Kewaunee County Landfill under the management of the Highway Commissioner, Dale Jandrin, adopted a new pricing and operational direction in the month of April based upon an “extend the life of the landfill proposal”. This proposal called for increasing the cost of garbage coming into the landfill and called for the amount of daily cover to be managed to a maximum of 25% of the total garbage coming in to the landfill which would adjust the number of tons of garbage coming into the landfill, increasing the revenue whilst at the same time extending the life of the landfill. The Highway Commissioner is responsible for managing the landfill, including cover. For the first three months under the new plan (May through July) the amount of cover has been running at 42% total landfill. If this is allowed to continue, the future of maintaining the Kewaunee County landfill is questionable. This has been allowed to happen even though the Highway Commissioner Mr. Jandrin is fully aware the landfill plan calls for 25% cover. At this time the Highway department has about 12 men assigned to the Landfill to complete the work on covering the cells that need to be capped. Preliminary numbers show that in all likelihood, this project will come in over budget further weakening the financial position of the Landfill Operations. Stand by for updates on how this is progressing. Is it time to hold the management (Mr. Jandrin, Hwy Commissioner and Mr. Dorner, Administrator to whom Mr. Jandrin reports accountable for the Highway Department (HD) losses ($2.8M since 2003 with nearly $2M in just the past four years). In addition to these losses, the HD’s audited numbers show a $609,000 cash shortage at the end of the 2012 fiscal year. This means the HD is “borrowing” money from the general fund to meet its financial obligations. Over the past seven years, the HD has on average been short $531,000 in operational funds. This department operates with and “enterprise budget”. This means that each year the department is, theoretically, supposed to operate with a zero balance at the end of the year, and it is up to the management to ensure we operate the department to that fiscal goal. Operating with a negative average of $531,000 is not exactly a zero balance and somewhere along the line this shortfall (according to both the auditors and the Wisconsin Counties Association) needs to be satisfied. So the question is where will that money come from? Most likely it will have to be taken out of the general fund. Let us first understand why the losses are being incurred. The answer is simple but yet complicated. Over the years, the HD has been receiving less and less work from the townships, yet the “full service” HD has not reduced any services, nor have they taken any steps to reduce overhead, staff, staff hours, salaries or benefits. For example, in 2003 the HD had 49 employees and the salaries for those employees $1,955,310. Through attrition, in 2012 the HD had 39.5 employees with salaries of $2,079,953—10 fewer people, but the salary cost had actually increased by 6.4%. The benefits have continued to increase in cost each year as well!. In 2011, the HD lost $695,000 and in 2012 the loss was $848,000. These numbers are primarily comprised of equipment depreciation and shortfall in revenue that was a budget number derived from estimated as revenue from the townships. Although the HD Commissioner and the County Administrator recognized this problem prior to 2011, they choose not to make any adjustments and continued to operate, business as usual. This led them into the 2012 losses, and, by the way, we are now a full 7 months into the new year and nothing yet has been done to reorganize or restructure the HD which means the losses month by month are continuing. Before I get into more detail I would like to say that Kewaunee County does have some great employees in the HD, and they handle their jobs professionally. They are not, however the decision makers and are ultimately going to be the folks that bear the brunt of the solution to the problem(s) of the department. So what to do? First of all, something should have been done about this several years ago, before the HD had burned through its cash reserves. When you analyze the problem, you quickly recognize the HD has been tailored around the snow removal requirements for the county. So, when there is a snow storm, it’s all hands on deck and everyone is busy for a day or two. Once that snow removal emergency is handled, then it’s back to maintenance of equipment and the HD buildings, etc. And, then when the snow season is over, the department is still staffed at the levels required to remove snow in the county. Other counties have dealt with this very problem years ago; they reduced staffs and outsourced snow removal to the private sector. And, believe it or not, it has worked for them, snow is plowed. The days of building new roads are in past, the number of miles of roads being resurfaced due to budgeting constraints are limited. So the options are then limited, especially when the townships in the county have pretty much moved away from utilizing the HD for their summer work for various reasons of their own. Rather than making the tough decisions to redefine the mission of the HD which would have direct impact on the number of employees in the department, the management elected to keep the staff full service HD intact. So the Commissioner decides upon introducing a 3 year contract in which the Townships would guarantee 125% of their Transportation Fund allocation to the county. He calls a July 2nd & P.M. meeting to discuss these new contracts with the Townships. Township boards did not receive this three page contract in advance of the meeting, instead, they were handed this contract in the room that evening. Additionally, the Commissioner announced in the meeting that if the townships didn’t sign this contract, the county would no longer plow snow for them. He also mentioned the price per hour of work completed by the HD would be increasing. Of course the next question posed by one of the townships was “how much would that increase be”? The Commissioner did not have those answers, and subsequently the meeting soon ended with the townships walking out of the room shaking their heads in dismay with plans to contact alternative sources for their snow plowing. So fast forward to the next HD meeting on August 2, 8:45 AM. No longer was the 3 year contract program in the mix. But now the Commissioner has decided to select seven townships that the HD would plow snow for and the HD would reduce the work staff by six people and with that remaining staff they could handle the state highways, county roads and seven townships. The criteria for selection of townships was going to be completed by the Commissioner and the County Administrator through a rather convoluted and confusing points system. After a lot of discussion the following motion was made by Highway Committee member Brian Paphlam – Kewaunee County HD would plow all towns and villages and continue operations with the current staff, until April 1, 2014 and double rates on equipment. Brian Dax seconded this motion. Discussion followed with a friendly amendment offered by Larry Kirchman and accepted by Brian Paphlam to include; during periods of no snow activity in winter season and no activity in the non-winter activities during construction season reduction in staff hours will be implemented. All in favor, motion carried unanimously. To clarify a couple of issues – In addition to the six work staff reduction, there would be an additional reduction in the office and management staff of two people. This means there would be a total of eight staff reduced overall in the HD plan. Each staff member on average with salary and benefits costs the county about $82,000 per year. So those eight employees cost the county roughly $650,000 or $55,000 per month. So this decision to keep the HD as is through the winter will cost about $380,000. By doubling the cost of the equipment by 100% to the Townships an additional $78,000 will be gained for the HD. So the net cost is about $300K. Then in April, the HD will have to pull the trigger on the future, they will have to finally make the tough decision. We are kicking the can down the road once again. * Weidner/Robert is the County Board Chairman and in his position receives an annual salary of $5,867 as well as one-half the cost of the county family plan health insurance which equates to $11,166. So the Chairman has received to date received salary, per diem and benefits of $21,550. “Now, when I was studying General Business in school, the general rule for borrowing money was to not go over two and a half times your income. Let’s call the County’s General Operating Budget of $25 million as our income. That includes our levy and all grant money coming the state and federal government. The County in NOT allowed to spend over that amount each year. And we never have. So based on the principle of not borrowing more than 2.5 times the $25 million we could conceivably borrow up to $62.5 million. Standard and Poor’s states that based on many criteria Kewaunee County could safely borrow up to $77 million. There is no one connected to County Government that would even dream of such a thing. And as a matter of fact each and every project that we have taken on over the past fourteen years has been studied and studied and studied to make darn sure we are doing the right thing for the best price. The County has a very long history of being extremely frugal. If one takes the time to listen to all of the facts, I would think that reasonable person would come to the same conclusion”. Kewaunee County has an equalized value of $1.4B. Door County is at $7.1B, Manitowoc County $5.1B, Brown County $17.2B. It quickly becomes apparent Kewaunee County cannot get the idea that we can spend at the same per capita levels as our immediate neighbors. We should be staffed and have salary levels of comparable counties like Jackson County with $1.4B equalized value and 21,499 residents, almost a mirror to Kewaunee County. Other similar counties are; Ashland County $1.2B, Price County $1.4B, Langlade County $1.6 and Taylor County $1.2B. I wish it would be easier to explain some of these issues, but particularly with the landfill and HD It is very hard to explain all the nuances without getting a bit wordy. PLEASE FEEL FREE TO FORWARD THIS TO YOUR FRIENDS, FAMILY AND NEIGHBORS, AND FELLOW TAXPAYERS IN KEWAUNEE COUNTY! You may recall from the last update, I had completed a Kewaunee County Employee Salary Study that illustrated our county employees were being paid on average, $3,700 higher per employee than employees of comparable counties. For the most part, my study produced results that paralleled the salary information the county received in the Carlson Dettmann study (by the way, the county paid $5,000 for the Carlson Dettmann study). I was allowed to present my salary study information to both the Kewaunee County Board as well as the Personnel Committee. The Personnel Committee is now in negotiation with the various unions to determine what will be done with salaries for the FY2013. A 2% across the board salary increase was put in the budget for 2013, but that has not yet been acted upon. My study of 172 county employees showed only a handful of employees should be considered for any increase and the Carlson Dettmann information revealed pretty much the same results. So, the message should be quite obvious to the Personnel Committee members, that being, many salaries should be frozen. Out of 72 counties in the state, Kewaunee County has the 5th highest tax levy with a 2012/2013 levy of $7.77. We have a debt in excess of $17,000,000 which totals to over $23,000,000 in debt and debt service. With the closure of the Kewaunee Nuclear plant, the county will be losing an estimated $700,000 annual revenue from that closure with no plan as to where or how that revenue shortfall will be made up. A comparison of our county employee’s salaries revealed over 90% of our county employees are being paid annual salaries averaging $3,700 higher per employee than employees of comparable counties. The consequence of losing the nuclear plant and the employment it sustained will cause a reduction in commerce across the county going forward. This will further erode the taxing opportunity in the county. Our Highway Department has lost $1,984,242 over the past 4 years (more detail on this, below). As a Member of the Kewaunee County Board of Supervisors, who do I represent? I represent all the people who live in my District. I heard it loud and clear from constituents that they were not happy about the way the county was being managed, specifically the issue of taxes and spending are high priority. Recently in an open session of the Personnel Committee after I presented my salary study information the District 3 Supervisor Charles Wagner commented, “I would like to commend Mr. Heuer for the work he has done on the salary information, but Mr. Heuer is biased. He is biased in favor of the taxpayer.” This statement really set me back as I have been under the impression that I am to be representing the taxpayers. If not the taxpayer who am I supposed to be representing? Perhaps you should contact your District Supervisor and ask them who they represent as there obviously is confusion on this issue. In our July 2012 Board Meeting we learned from the Administrator’s (Mr. Dorner) report that the Kewaunee County Highway Department has lost $695,000 for the FY2011. This department is supposed to operate at minimum a zero budget. I asked the obvious question, “Why did we have to wait seven months into the new fiscal year to learn we had that kind of loss?” I was informed it took until June for the audited numbers to be presented. The next question was, “What will the next 12 months bring us?” Mr. Dorner informed the board at that time we’d more than likely continue to lose money given the high cost of depreciation on our little used equipment and/or unless the townships would give more work to the Kewaunee County Highway Department. Following this July 2012 meeting, I met with Mary O’leary, the Highway Office Manager who did an excellent job in walking me through the entire budget process at the Highway Department. I would add this is quite a complicated budget as there is a merging and tracking of various Federal, State and local funds. We spent a couple of hours going over this process and following this overview, it was quite apparent to me that unless major operational changes were made in the Highway Department the department would continue to lose money. Mr. Jandrin joined us at the end of that meeting and he agreed changes were necessary. Well that was a year ago, and now we have learned the Highway Department has lost another $848,787. But now this is a real problem as we have “hit the wall” because the Highway Department no longer has any surplus to cover this loss. We had a surplus of $824,897 which means we have a shortfall of some $24,000. This shortfall has to come from somewhere, more than likely the General Fund. This is not acceptable from a management perspective as there were actions that should have been implemented that could have eliminated, or at a minimum reduced these losses – but nothing was done. As you will see from information presented below, this is an ongoing issue. I would like you all to understand the “chain of command” for the Kewaunee Co. Highway Department. Several months ago, while attending a Highway/Solid Waste Committee meeting, I was observing and was quite surprised at the lack of progress the committee was able to make with the Highway Department. So I probed, I asked the question, “Where does the buck stop with the Highway Department?” “ Is it with Mr. Jandrin, the Commissioner?” Mr. Dorner was in attendance and he informed me that Mr. Jandrin reported to him directly and therefore, ultimately the performance of the Highway Department rests with him. The Highway/Solid Waste committee is a policy setting committee and does not manage nor is not responsible for the management of the Highway Department. I have placed below a table with some updated financial information on the Kewaunee County Highway department for the period 2003 – 2012 (these numbers have been provided by the highway department directly). I summarize the performance as UNDERWHELMING! Let me be very clear about this though. I do not find fault with the individuals who work in the highway department. We have some very capable, responsible employees in that department who are dedicated to providing good service, to and for the county. I do however, find fault with the senior management and leadership in that department as they are not efficiently managing the results of the Highway Department. Note 1 – Look at the cost of employees. In 2003, 49 employees, $1,955,310 salary — 2012 10 fewer employees, with a payroll of $2,079,953 in salaries. Average salary cost per employee increased by $12,753. This is base salary only and does not include any benefits, which are an estimated 84% of the salary number. Note 2 – For the period 2009 – 2012 the Highway Department has lost $1,984,242. Note 3 – For the period 2009 -2012 the Highway Department billed the Kewaunee County Landfill $1,749,975. Had this work not been available for the Highway Department, the department would have lost $3.7M during that same window of time. Note 4 – 2009 – 2012 – 7 miles of road built and 27 miles of roads resurfaced. (2009 included work on AB to J, County Rd X -57 to Cardinal Rd, Cty C – S to Cardinal, Cty D, S to X, Cty S, FS to H) AB work was funded as part of a $6M grant. Note 5 – We have now hit the wall. In 2007 we had a surplus of $2,098,196 and from 2007 through the end of year 2012 we have burned through that surplus and are now left with a $23,890 shortfall that must be made up from the general fund or some other source. Also, we are now 5 months into the new year and no action has yet been taken to adjust any expenses at this time. Note 6 – Between the stimulus money and the Surface Trans. Program (Obama stimulus money) the county has received $1,693,806 of Federal funds that have been spent by this department. Why do I delve into the issues I report on? I am quite attuned to the activities in our government both on state and national basis. As we can see on a national basis, with the IRS Scandal, the Sebelius Obama-Care shake-down, the Attorney General Scandal, the Benghazi Scandal, our bloated, costly government seems to be out of control. Our government is too big, unwieldy with hundreds of overlapping departments that justify their existence by rolling out, what they consider, new innovative programs that are many times already offered and funded through other departments. This kind of inefficiency, waste and bureaucracy exists at all levels of government and, having the personal experience of operating businesses in the private sector, I am appalled with the lack of management and attention to detail that I see in government. No one wants to be held accountable for their lack of leadership and management. That is unacceptable to me and I will not sit idly by while our tax dollars are wasted. My mission is to hold the public sector management of Kewaunee County responsible for the efficient management of our tax dollars. Kewaunee County GOP was once again recognized by the State party for the hard work we all put into keeping the GOP vibrant in our county. Thanks to all of you who helped make this award possible. Please feel free to forward this post to all your Kewaunee County friends, relatives, in-laws, outlaws, business associates, etc. If you have in the past surmised that our Kewaunee County employees are compensated fairly, my guess is you were correct. I completed, on my own time, a salary comparison of Kewaunee Co. employees to those of 11 other counties and found our employees on average are being paid $3,700 higher than employees with comparable jobs in other counties. I have attached both my Kewaunee Co Board Activity Update and my Salary Study as PDF’s as that seems to be a universal format that everyone can open. If you have any problems opening the attachments please let me know. On the landfill, the resolution that was in front of the board which would have prevented expansion of the landfill to Phase III has been withdrawn. Click here to download the Kewaunee County Board Activity Update. Click here to download the Salary Study. PLEASE FEEL FREE TO FORWARD THIS POST TO YOUR FRIENDS, FAMILY AND NEIGHBORS AND FELLOW TAXPAYERS IN KEWAUNEE COUNTY! Here is what happened at the Dec 18th Board Meeting with regard to the aforementioned resolution. Supervisor James Barlow, (District 14, Algoma) immediately upon reading made a motion to table the resolution (when a motion to table is on the floor, there is no discussion, simply a vote). A vote was taken and it was a 10 to 10 vote, which then kept the motion on the floor. Here are the people who voted in favor of tabling the motion – Koenig / Wagner / Swoboda / Reckelberg / Mayer / Barlow / Hutter / Paphlam / Abrahamson / Dax. Then Supervisor Barlow in an impassioned ramble moved to have the motion sent back to the personnel committee. At this time the floor should have been open for discussion on the motion, but it never was. A vote was taken without discussion and this issue was sent back to committee, where, it will die. Here are the supervisors who voted in favor of sending the motion back to the Personnel Committee – Koenig / Wagner / Swoboda / Reckelberg / Mayer / Barlow / Hutter / Paphlam / Abrahamson / Dax / Heidman / Garfinkel. Well, guess what happened at the Jan 23rd, Personnel Committee when this was taken up? Chairman Weidner attempted to stimulate some discussion on the matter, but immediately Supervisor James Barlow, (District 14, Algoma) led the way to table any action on this issue for an indefinite period of time. So, once again, when so much indignation was voiced by Supervisors Wagner and Barlow at the December Board meeting about the arrogance of individual board members to bring forth a resolution to the full board without the respective committee acting on an issue, nothing is once again accomplished. Committee Member Supervisor Bruce Heidman had an excused absence from this meeting . Chairman Robert Weidner, Supervisors Linda Sinkula and Kay Shillin voted in opposition to tabling the issue. Supervisors James Barlow, Brian Paplham, Charles Wagner, Chuck Hutter, David Mayer voted in favor of tabling this issue indefinitely. So, here we are, February 10 and we have not been able to cut anything out of the budget. Remember, we have $17.3 Million of structured debt and over the term of this debt, (the debt plus the interest combined) is in excess of $23 Million. And with the Kewaunee Nuclear Plant being closed down there will be loss of hundreds of thousands of revenue that will be lost to the county and will have to be made up somewhere? On a positive note, regarding the landfill, Highway, Solid Waste Committee Chairman Bruce Heidman has appointed Supervisor Kirchman to investigate all options available to the County with regard to the landfill and Supervisor Kirchman is now exploring all those options and by going through this process the “right decision” concerning our landfill continuation or closure will come to the surface. 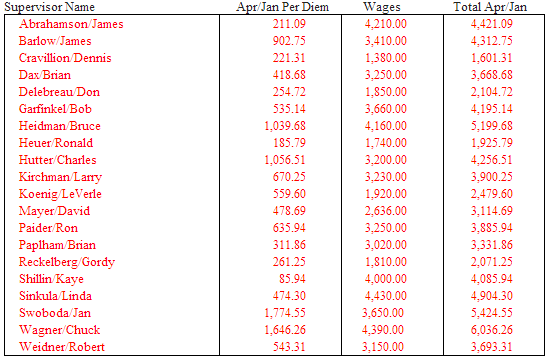 Here are the current numbers on meeting wages and per diems for the County Board Members. A couple of things you should be watching as we go forward, you may want to voice your opinion(s) on these issues in upcoming Board Meetings or at the Personnel Committee Meetings. I am personally opposed to any across the board increases for our county employees, and given the votes on motions presented at the October Budget Approval meeting, there are a solid eight board members who agree with me. Given our current financial position, it is time to start making some of those hard decisions I have discussed in previous updates. It is time our Board supports the taxpayers in the county. If you have been following the recent salary information reported by Gannett, the private sector has been made aware of how good the Public Sector has been treated by the Taxpayer. It is time to change that. We simply cannot afford this anymore. Below is the “Party Column” by Republican Party of Wisconsin Executive Director, Joe Fadness. Since the mid-term elections in 2010, Wisconsinites have been burdened with election after election and a never-ending campaign cycle. Over that time, Republicans have stood unified against the attacks from big union bosses and special interest groups. 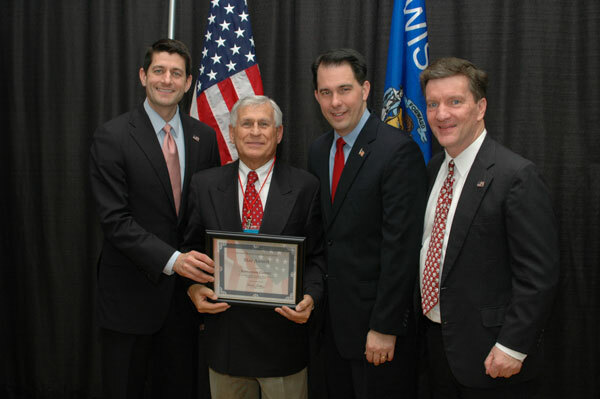 The state of the Republican Party of Wisconsin is strong – and we have you to thank for that. Together in 2012, we protected our Governor and Lieutenant Governor from a baseless recall, captured back the State Senate, made gains in the State Assembly and returned all five Republican Congressional members to Congress. And while we have many reasons to be proud, we cannot be complacent if we want to continue such success in 2014. The Republican Party of Wisconsin is excited to launch a new grassroots initiative – Project GO RED. This first of its kind program is aimed at building county parties, stimulating grassroots activists, and engaging likeminded coalition groups who believe in our common sense, conservative approach to government. Project GO RED will serve as a catalyst to lay the foundation in 2013 for a successful and rewarding campaign season in 2014. To help reach our goals, the Republican Party of Wisconsin will retain four permanent Regional Field Offices across the Badger State. This tremendous investment will serve as a base of operations for all things Republican in their respective areas. The full-time staff will partner with you as we work to build and move our parties forward. We must lay the groundwork today if we want to be successful in the mid-term elections. Project GO RED will help determine if 2014 is another historic year for Republicans in Wisconsin. As partners, we will create an unprecedented grassroots organization to protect Governor Walker, Lt. Governor Kleefisch and the gains we have made in the State Legislature. At last, the Kewaunee GOP Newsletter has returned! It was emailed out to all members on January 3. If you are not yet a member, you are missing out. Click here to download & view the January, 2013 Newsletter.